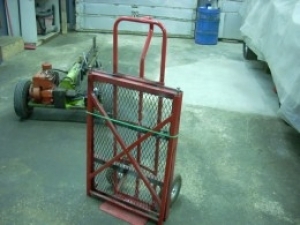 Homemade portable welding table fabricated from angle iron and 1" square tubing. Features an expanded metal top. Utilizes a two-wheeled dolly for mobility, and folds for ease of storage. This portable table is a clever idea...but it seems to require a dedicated hand truck and the expanded metal top is discouraged. I'll reserve judgement. This looks like it has just the right balance between being portable yet good enough to light- to medium-duty work.